Dr Schnieder's bottom line is that if you don't fit your change effort into something that aligns with culture it will be an uphill battle and it won't stick. Change has to be managed at a total system level, including culture. This message resonates with me. In the details of the article he goes on to explain some of the issues and characterize different organizational cultures. I have reproduced the concepts in a bastardized graphic here. The model is a two axis, 4 box grid, just like the rest of them, so that's an alert to realize that this is a limited model and needs to be considered in a broader context as well (for example, what about organisational structure, or size?) But for now it suits a purpose in enlightening our change efforts. The first of the two axes is a focus on the current state or a focus on the potential future state. This gives an organisation an inclination to either improving performance from existing operations or else changing operations to improve. A subtle difference in phrasing, but substantial in it's implications. The second is in understanding values about decision making - do we trust the system or do we trust the people. Stating it like that probably gives away my bias, and you already know my thinking here anyway, but this is in my view, tightly linked to the today/tomorrow axis. What are you making your decisions based on? 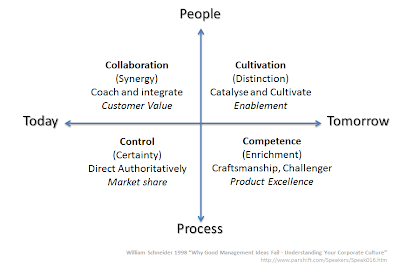 The capability of your people and processes today or their potential? I have modified some of the terms to both simplify the ideas and to link them to conversations going on in industry today. You can read the whole article to get a better explanation of the details here. A last point before I sign off with a few questions; Dr Schneider reminds us that a change effort needs to align to the much more powerful forces of organisational culture. 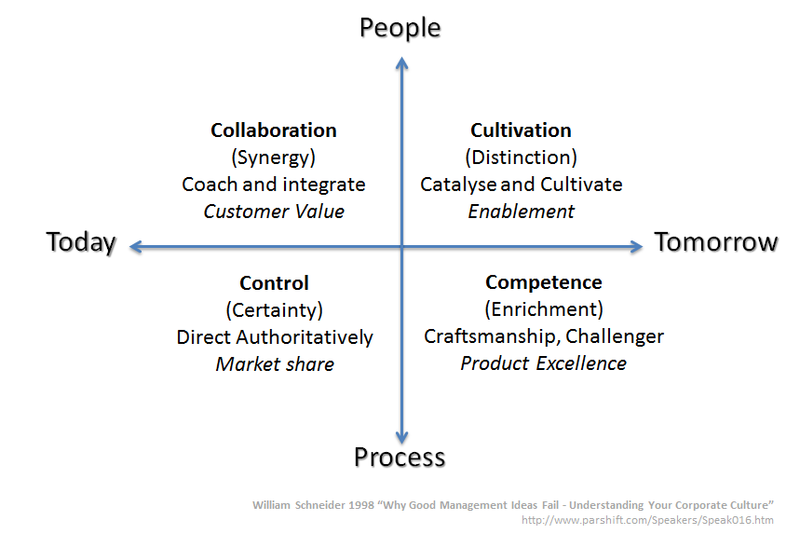 Either pick a method that aligns with the existing culture or at worst, pick one that is from an adjacent quadrant in the model. If you don't leverage the forces of culture your change effort is futile. I partly agree with this. I do think that you can go against the grain. It's just that these change efforts are more disruptive, much harder and rely upon commitment from everyone top to bottom on the org chart (and probably customers and suppliers as well.) I believe this because there are companies that have done this, often driven by market failure and catalyzed by new leadership. As I said above, there is more to this that the model illustrates and there are always exceptions to the rule, but it is a useful tool when considering consulting and change management work. What are your colleagues like? Where do they naturally fit into this model? What sort of organisation do you work for today? Where should you be working? Hi Craig, a great reminder about the fragility of changes not grounded in cultural changes. Readers - there is an error in my diagram, so now you HAVE to read the original.